We left from Leh at 1 PM. 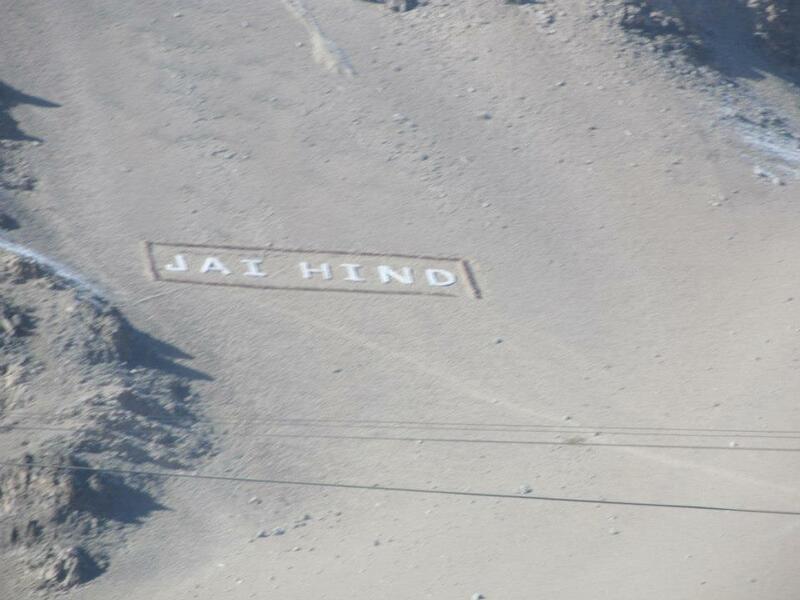 The road from Leh to Chilling was a path of tar, covered with snow and intersperced with military camps. We also found a lot of mountains where fellow people had assembled small rocks to write several slogans like ‘Dare to Win’ and ‘Fly High Through the Sky’. 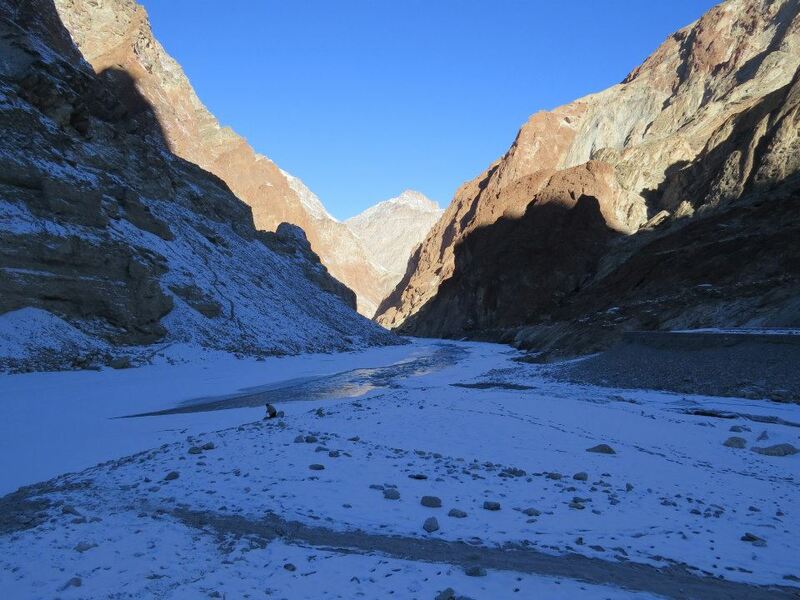 The Indus gave us company through most part of the ride, until the Zanskar took over at Nimu. It was already dusk, so we decided to ride further ahead from Chilling and reached a place about 20 minutes away from Tilat. Here, we left the road behind and hit the Chadar. It was windy and the winds hit us full in the face the moment we got down the bus. Following a brief downhill trek from the road to the river, we started walking on the Chadar. Looking at them, you would feel they completed the trek! 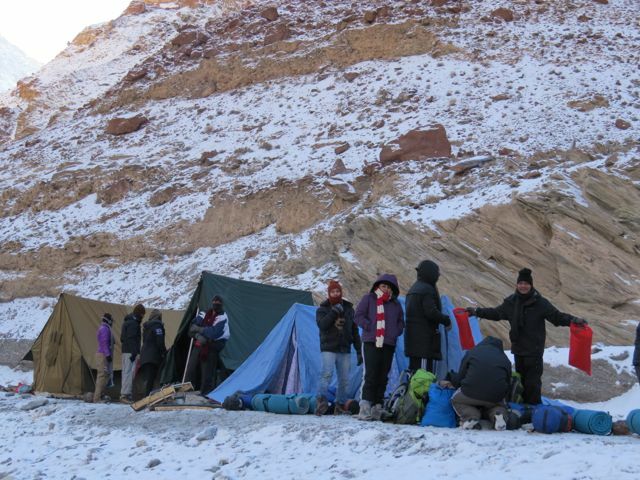 After 15 minutes of walking, we reached our first camp site – Tilat Sumdo. The porters had already started erecting the tents and the cooks had begun their preparations in their tent. Shortly, we were served steaming hot tea and soupy Maggi noodles. As we held the hot bowls in our hands and started stuffing the food down our throats, we could feel the relief spreading through our frozen fingers and hungry stomachs, both at the same time. Four of us girls – Ruchi, Gayatri, Sarita and I occupied the biggest tent. Rest of the people occupied the smaller tents as group of three. It wasn’t any warmer inside the tent though – they were summer tents, and for the climates we were up against, they were no match. As it got colder outside, I realized that my feet had become so cold that they were painful. A lot of other people were really cold, but as it was already dark when we had arrived, our helpers hadn’t had any time to gather wood for a fire. So instead, we all stepped out and walked a little way to the fire the porters had made. It was smoky, but we gathered around it nevertheless. By the time my toes had been unfrozen, it was time for dinner. Somehow, they had made a small fire while we were away, so the dinner (rice, dal and a cauliflower gravy) was a merry event. But our spirits sagged the moment we entered the tents. The mattresses were so cold we thought they were wet, and the bundles of sleeping bags strewn on them were colder. By the time we opened the bags and arranged them for the four of us, my hands and feet had become painfully cold again (we had removed the shoes for hygiene sakes and the gloves for better maneuvering.) Sure that I won’t be able to sleep so early, I decided to visit one of the guys’ tent. There were just Kartik and Dileep in the tent when I entered. As we lay down, Prarabdh and Anuj joined us, followed by Jay, and then Utkarsh. With seven people lying in a tent for two, the entire place became really warm. With 14 legs and feet overlapped over one another, I could soon feel my toes sweating. We sang songs for a long time – all the numbers of Hum Aapke Hai Kaun and Dilwaale Dulhaniya Le Jaayenge. As Prarabdh, Anuj and I sang, Dileep dozed off, Kartik sang and hummed along in the background, and our hoarse and happy voices reached every other tent, ensuring that as we remained awake, nobody else slept either. Well, nobody with the exception of Gayatri, but we will come back to that later. So what did the rest of the lads and ladies do? Bhavdeep tried to sleep, but couldn’t. So he also joined our throng. Jay was summoned by Sarita, so he left our presence. Ramesh, packed and asleep in his sleeping bag, was woken up by a paranoid Vishnu, who wasn’t able to breathe. Mustering all of his courage, a freaked-out Ramesh wrenched himself out of the sleeping bag and carried the message to Ruchi. The message also reached Utkarsh, and he left the tent to tend to the matters. Back in my tent, Vishnu was better and Jay was about to leave. He gave me 2 spoonfuls of Brandy, and left. With the warmth of the Brandy trickling down my throat, I tried to get into my sleeping bag quickly. But the tent was cold, the sleeping bags were colder still, and within 15 minutes, I was cold all over again. Covering my nose with a scarf and taking long deep breaths, I tried to rest with my eyes closed. I could hear voices all around me – the mountains had a strange acoustic system. In one tent, as Ramesh tried to get into his sleeping bag again, Vishnu asked him, “Ramesh, do you hear this? There’s someone walking beside our tent every 2 minutes. See… Listen… You see? That’s the one!” Freaked out again, Ramesh convinched him, and himself, that it was just the wind and nothing else. In another tent, 3 tents away, though it sounded as if it was right beside me, I heard Kartik’s voice. ”I am coming guys.” And then Anuj shouted, ”nahi, nahi, no, no, dheere, dheere, dheere, slow, please, no, no!” An entire tentful of people started laughing. Suppressing my laughter so as not to wake the girls up, I started trying to sleep again. Outside, the wind blew, bringing the temperatures lower. Anuj howled, calling upon the wild of the mountains. I shivered, kept on shivering in the double layer sleeping bag. And beside me, under the magic of 3 spoonfuls of Brandy, Gayatri snored on. *The previous part of this journal can be found at The Chadar Trek Journal – Julley! 6 Responses to "The Chadar Trek Journal – Day 1 – Leh to Tilat Sumdo"
Am glad you didn’t get frostbite. I don’t know what the temperatures where, but when I was in Minnesota, that was one thing we always were to take care of. In the morning we leave by private vehicles with our support staff to begin this amazing and most exciting winter trek. Shortly after leaving Leh, we reach Nimoo, the confluence of Zanskar and Indus rivers. 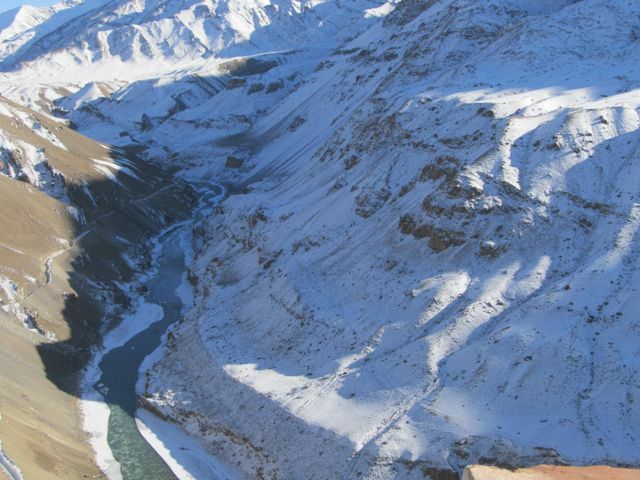 The sight is amazing as the iced up and frozen Zanskar meets the fast flowing Indus. 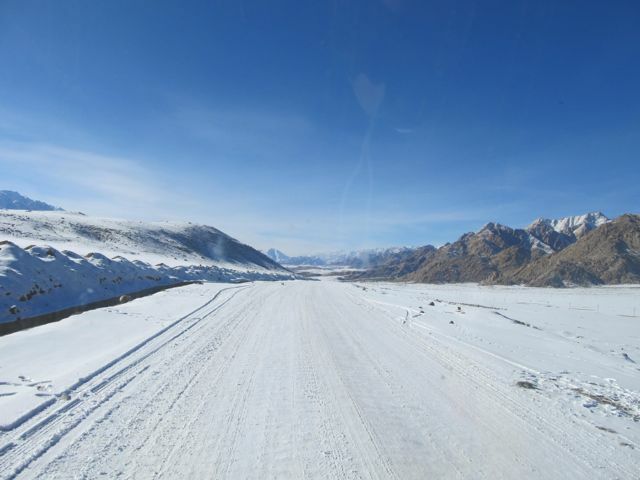 A great place for Photo Stop.We then turn down from Nimoo following the track parallel to the frozen River Zanskar, a drive towards the road head beside the frozen river is another amazing experience. Travel distance between Leh and Chilling is around 64 KM. We reach the point, past the village of Chilling to where the road head ends. Touching the Chadar first time, we start the trek for 1-2 hrs along the magnificent frozen river Zanskar till Tilat Sumdo. Overnight in tent. 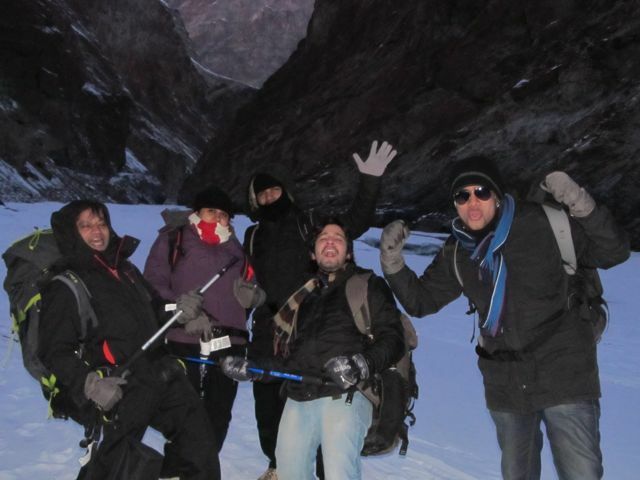 Again one of the magnificent days on the Chadar trek. However, the caution being that this can become difficult if the Chadar is not very firm. The vistas are stunning though as we pass through giant frozen waterfalls, ice cliffs and one may even catch sight of the mountain fox. – After lunch we pass the ‘incense tree’, so called because the locals use its branches to burn in their morning rituals, and the prayer flag draped tree marks the entrance to Zanskar proper. The porters will normally take a few twigs from the tree. We reach Naerak campsite by late afternoon. An old, dilapidated bridge on the river as folklore goes is thought to be more than an 1000 years old. A trail is normally beaten through in the snow towards the village up high in the mountains. Overnight at camp. Though technically it is the same way back, it is also quite different. The Chadar or the blanket of ice that is forming on the River Zanskar is always changing, breaking up and forming itself again. As the Chadar dynamics are ever changing, the same route and place would look and feel different as the texture and conditions change. All along the way, cyclists will pass by and meet a lot of locals wearing their traditional woolen Gonchas, trekking their way towards the village of Padum, Lingshed and Naerak. Pleasantries are exchanged and even a few stories and legend about Zanskar and its people can be heard. Their warmth and smile is amazing among all the hardships. Overnight at camp. Today we trek from Dibb to Shingra Koma. Shingra Koma is a big camping ground on your right as you walk up stream. Its right below a huge stone wall which is straight out of a hollywood movie. The Zanskar river takes a beautiful turn right in front of the camp site and sharp peaks rise on the other side of the river. DAY 8 – SHINGRA KOMA – TILAT DO – LEH. Today is the last day of this amazing and unique trek. We finally return back to the road head where our vehicle will be waiting to take us back to our hotel at Leh. On arrival at Leh, check into your hotel & relax & linger on to the experiences of this ice trek that you will always remember. DAY 9 DEPART FROM LEH. 	Meals while on trek . 	Trek equipments (Sleeping bag, mattress, Kitchen & dinning tent, crampon, utensils, tent). 	All necessary permits and entry fees. 	First aid medical kits, and oxygen cylinder. 	Mountaineering qualified & professional trek leader, guide and support staff. 	Transport from Leh to Road ahead and return back. 	Any kind of personal expenses. 	Food during the stay in Leh. 	Trekking fee to LAHDC 3000/ for foriegner and 2000/ for domestic tourist. 	Any additional permits levied over currently applicable by local authorities.